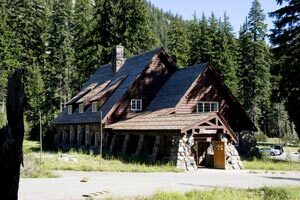 Rustic Architecture of Crater Lake - Explore! 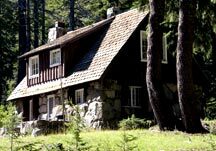 Rustic Architecture of Crater Lake - Explore! After Crater Lake National Park was designated in 1902, better access was needed. In 1904 construction of a new road was begun to replace an “almost impassable” wagon trail to the rim. The new road passed through Munson Valley on its way to what is now Rim Village. It was completed in 1905. It wasn’t until 1913 that Congress appropriated funds for the Army Corps of Engineers to begin work on Rim Drive. The Corps used Munson Valley for it’s seasonal headquarters and supply station. When the road was finished in 1918, the Park Service continued to use the facilities as a base for operations around the park. Known as “Government Camp,” the site became the park’s summer headquarters. Unfortunately the facilities were not well designed for the heavy snows that blanket this area each winter and they began to deteriorate. Starting with a master development plan in 1925, the Park began development of the buildings now seen at park headquarters in Munson Valley. The structures, made of wood and stone, were designed and positioned to serve park employees and visitors and, especially, to blend with the natural landscapes of the area. This type of rustic architecture is indicative of developments in the National Parks in the 1930’s and later. The Munson Valley area is one of the best examples of this type of architecture and was listed as an Historic District on the National Register of Historic Places in 1988. Thanks to the Park Service, exploring the architecture of Crater Lake National Park is easy. 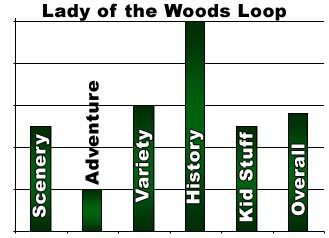 Plus, there is an extra bonus known as “Lady of the Woods.” Start your expedition in front of the Steel Visitor Center in Munson Valley. The Steel Visitor Center began life in 1932 as a dormitory for park rangers. Wander around inside to see how it would have functioned before it was refurbished into a visitor center. Once back outside, face the building and walk to your left to the walkway that leads behind it. You should see a sign that says “Lady of the Woods Trail.” This is the beginning of the Lady of the Woods Loop trail. Lady of the Woods is a sculpture carved in a large rock between October 4 and October 19, 1917 by a young doctor assigned to the Corps of Engineers. 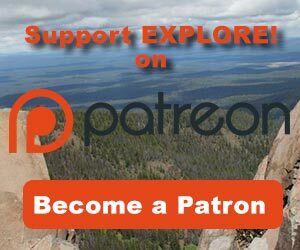 According to the Park Service, Dr. Earl Russell Bush’s work attracted little attention from his co-workers and, as he left the park for the season, he asked the Park Superintendent to keep the source of his work secret. The secret was only to be shared with William Steel who was Commissioner of the park at the time. They kept the secret. As the remarkable sculpture was rediscovered over the new few years, many stories developed. 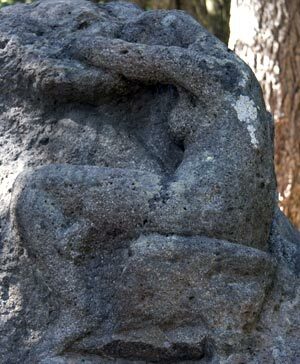 Samuel Hubbard, curator of archaeology at the Oakland Museum, even speculated that it might be the cast of a real woman, somehow encapsulated in a lava flow. This theory came about in 1923, two years after Bush’s role in the sculpture had been publicly revealed by one of his friends and published in an article by Anne Shannon Monroe, a well-known author of the time. Bush says he made the carving out of respect for the Park’s wilderness attributes and its fecundity. The trail that leads to the sculpture was constructed in 1924 and is the first part of your journey. Pick up a trail guide at the bridge over Munson Creek, right behind the visitor center. 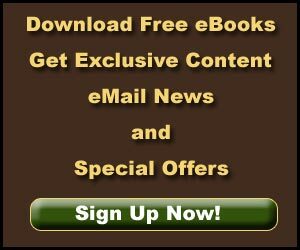 It will add great depth to your exploration of the park’s architecture. This is also stop number one where you will be guided to examine the back of the Rangers’ Dormitory (now, the Steel Visitor Center) to see how local materials are integrated into the building. Stop 2 gives you a great view of the maintenance area of the complex. You’ll be able to see the mess hall, meat house, lumber sheds, warehouse and machine shop, all built between 1929 and 1934. Stop 3 is the sculpture. Continue on the trail to get views of employee residences. the superintendent’s residence (now the Park’s Science and Learning Center), the naturalist’s residence and the administration building. Along the way you will discover that the sides of the buildings look different to reflect the natural variety in the park. You will learn that the buildings were placed as they are to provide seclusion for residents and access to the office buildings without overwhelming the natural appearance of the area. As a bonus, Stop 8 brings you to a small wetland that creates a vivid wildflower display from late July into mid-August. 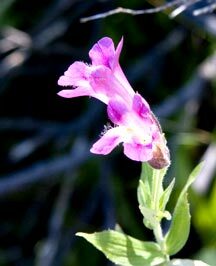 For more information, be sure to check out our article on the wildflowers in Crater Lake National Park. The trail completes its 1/2 mile loop back at the visitor center. We gave this adventure a 10 for history – that’s what it’s all about. The natural scenery is nice too, but not as unique and expansive as many of our other adventures. It doesn’t take an adventurous soul to make this short walk. It is, essentially, a walk around an urban area – albeit with some big trees, a couple bubbling brooks and a huge rock cliff that you normally wouldn’t see in an urban area. The variety derives from that unique combination of urban area, historic structures, big trees, bubbling brooks and the huge rock cliff. It’s certainly a kid friendly trail and if you leave it to your kids to explain the source of the lady on the rock, you may get their creativity going. Overall, we gave this place a rating of 5.6 on our scale of 10.